The following is a poem by the Irish poet Biddy Jenkinson (below right) who is a highly regarded Irish language writer and poet. 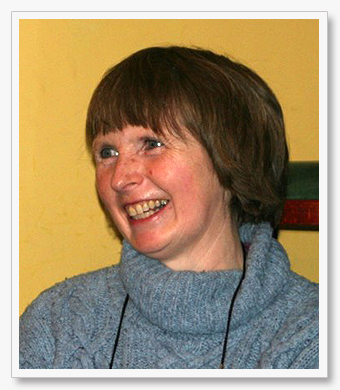 She writes almost exclusively in Irish gaelic and has produced several collections of poetry as well as prose and other writings. In Praise of Wooden Flutes may well be the authors 'one-and-only' exception in English and Martin Doyle, who holds Biddy in very high regard, is proud to present this lighthearted but very relevant piece on his website. flutes and men, alike, bore me. and grumbles about cold and rain. cucumber cool, when she is hot. and contract when the playing stops. and all my spits are strong as stout. Whatever cannot die, is dead. of sun, moon, rain, wind, seed, shoot, leaf. It learned to sing in swaying trees. Let angels play on plastic flutes. Angels are perfect, above all craic. Fallen Eve says Timber! Wood! And Devil mend it if it cracks!